In My Little Pony Equestria Girls, released in fall 2013, Twilight Sparkle’s crown was stolen from the Crystal Empire, and she pursued the thief, Sunset Shimmer, into an alternate world where she finds herself turned into…a teenage girl! To regain her crown and return to Equestria, Twilight had to learn how to fit into this strange, new world and defeat Sunset Shimmer in a competition to become crowned Princess of the Fall Formal at Canterlot High.Now, the girls of Canterlot High are back, and this time they’re rocking guitars! In My Little Pony Equestria Girls: Rainbow Rocks, Canterlot High (CHS) is hosting a musical showcase, and Rainbow Dash, Applejack, Pinkie Pie, Rarity, and Fluttershy are going to be performing with their new band, The Rainbooms. But when The Dazzlings, a new girl group, arrive at CHS and convince everyone to turn the friendly showcase into a Battle of the Bands, tensions mount between the competing musical acts. A now-reformed Sunset Shimmer realizes that The Dazzlings may not be ordinary girls and are after something far more sinister than just being named Best Band at Canterlot High. The Rainbooms call on Princess Twilight to restore harmony to their world to help them perform a musical counter-spell so that they can win a battle that now determines the fate of the entire school. My family was lucky enough to have the chance to watch the movie for ourselves and my kids seemed to love it. Admittedly, I tend to prefer the actual My Little Pony over Equestria Girls, but that's just me. My son (also a My Little Pony fan) did not care one way or another and couldn't wait to watch. The movie was cute and fun...filled with magic, adventure and great music...everything needed to keep his attention! I know if my 7 year old boy likes it, the die hard Pony fan is sure to love it even more! The Bluray offers some great features for the ultimate fans as well like an audio commentary so fans can get a behind the scenes look, 8 prequel shorts for even more Equestria Girls fun and 3 sing-alongs. This is definitely my favorite feature, as there is nothing my kids love more than singing along to their favorite songs!! And when you buy the regular DVD and receive a coupon for $4 off when you buy the movie and an Equestria Girls toy! This is a great way to save for the holidays! 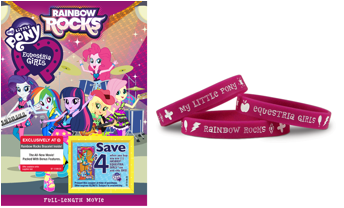 Target has an exclusive version of the My Little Pony Equestria Girls Rainbow Rocks DVD, which has a Rainbow Rocks bracelet inside, and a coupon to save $4 when you buy any one Equestria Girls toy and the DVD. 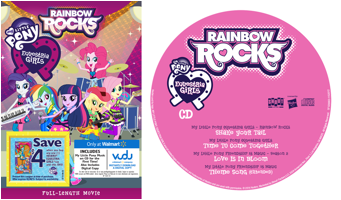 Only at Walmart, the My Little Pony Equestria Girls Rainbow Rocks DVD includes My Little Pony music on CD for the first time, a digital copy of the movie, and a coupon to save $4 when you buy any one Equestria Girls toy and the DVD. 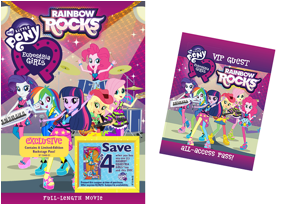 Kmart is offering an exclusive version of the My Little Pony Equestria Girls Rainbow Rocks DVD that contains an exclusive Limited-Edition Rainbow Rocks Backstage Pass, and a coupon to save $4 when you buy any one Equestria Girls toy and the DVD. Sounds great, doesn't it? Ready to purchase for the My Little Pony fan on your list? My Little Pony Equestria Girls: Rainbow Rocks is now available to order at Amazon.com, ShoutFactory.com, Target.com, and Walmart.com, and in stores. 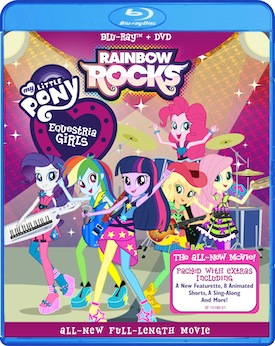 For more information on My Little Pony Equestria Girls: Rainbow Rocks, please visit www.mlpeg.com.